Transfer of Justice Rajiv Shakdher of Delhi High Court has invited strong reactions from the members of the legal community. 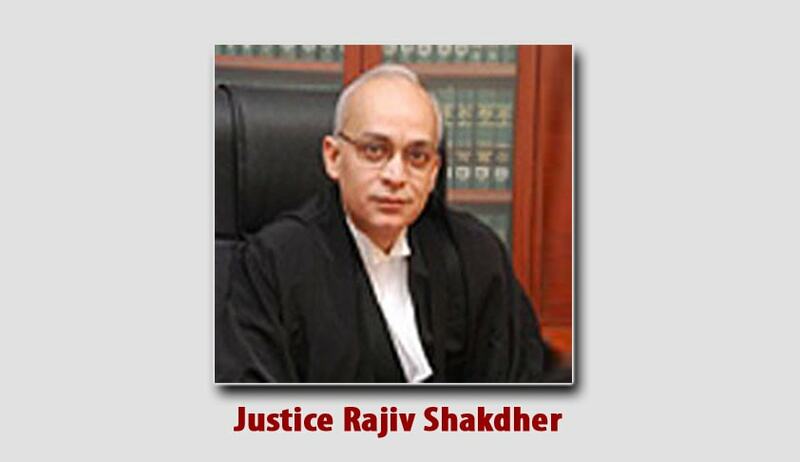 Many senior lawyers and former Judges feel that the decision of the Supreme Court collegium in transferring Justice Rajiv Shakdher to Madras High Court is unjustified. Justice Shakdher is well known for his integrity, boldness and hard work. He joined Bench of Delhi High Court in 2008 after giving up lucrative legal practice as a Senior Counsel. “On one hand you complain about not getting right candidates and on the other, you are rewarding people like Rajiv who sacrificed a lucrative career and joined the bench, like this”. A Senior lawyer, who chose to remain anonymous sarcastically quoted. “ On behalf of respondent no.1, an attempt was made to defend the scheme / policy presently in place by relying upon the mechanism in place in the Punjab and Haryana High Court. I have consciously chosen not to discuss the schemes / policies for engagement of LCRAs which is prevalent in other High Courts for two reasons. First, in the present matter the schemes / policies of those High Courts are not under consideration or challenge. Second, the petitioner has cited examples of various High Courts where empanelment of select Law Colleges / Universities is not the route followed, while considering applicants for engagement as LCRAs. Therefore, mindful of this situation, I have chosen to only concentrate on the scheme / policy formulated by the Supreme Court. Therefore, I have no hesitation in declaring that the scheme/ policy, as formulated, is unconstitutional. This is not to say, that respondent no.1 cannot devise a scheme/policy. It is undoubtedly empowered to design a policy which is fair and equitable, and that, which enables every aspirant to be considered for engagement as a LCRA. Necessarily, the mode and manner of sifting the source would have to be devised by respondent no.1. Therefore, to the extent the present scheme/policy confines the source of candidates, for engagement as LCRAs, to the empanelled Law Colleges and Universities; it is illegal. That said the concerned Judge with whom a LCRA is to be attached will ultimately have a say in the matter. The concerned Judge would necessarily have a pool of eligible LCRAs available with him / her from which he / she could choose a particular LCRA for attachment”. LiveLaw sought the reaction of many lawyers and former Judges, and they all shocked when they heard the news of Transfer, particularly of Justice Rajiv Shakdher. “if there is any complaint against any Judge on behavioral issues, it should be addressed through a proper in-house mechanism, not by transfer” referring to the transfer of another Judge of the Delhi High Court, a lawyer opined. It is learned that Judges are saddened by hearing the news as they are transferred along with some of the most controversial judges of recent times. Generally, no specific reasons are assigned when a Judge is transferred in India ,thanks to the opaque system of Collegium. Corruption charges, can’t obviously be sited as a reason, because no judge is allowed to continue in any High Court when there are charges of corruption. Other reasons being sited in Media or in‘Court Corridors’ are reckless behavior or kith and kin issues. This again a mystery never resolved, if such test is applied, the number of transfers would be crossing all imaginable limits. “Where do they transfer Supreme Court Judges” another Lawyer jokingly commented. “These cases have made us think about ourselves and our learned brothers in the superior judiciary of the country. We are made to realise that we are all mortals with all the human frailties and that only a few know in this world the truth behind the following statement of Michel De Montaigne: "Were I not to follow the straight road for its straightness, I should follow it for having found by experience that in the end it is commonly the happiest and the most useful track". It is true that the Judges of the High Courts and the Supreme Court hold their tenure not at the pleasure of the President but till they attain the prescribed age of retirement; that their removal is possible only after following an elaborate procedure: that their salaries and allowances and pension are charged on the consolidated funds of the States or of the Union; that no discussion can take place in the legislatures with respect to their conduct in the discharge of their duties except on a motion for their removal; that they have the power to punish a person for contempt of court and they are protected by a host of other provisions of law which arc intended to make them feel and to remain independent of any external agency such as the executive. These, as far as they go, are necessary for ensuring the independence of the judiciary. But if the judiciary should be really independent something more is necessary and that we have to seek in the Judge himself and not outside, A Judge should be independent of himself. A Judge is a human being who is a bundle of passions and prejudices, likes and dislikes, affection and ill-will, hatred and contempt and fear and recklessness. In order to be a successful Judge these elements should be curbed and kept under restraint and that is possible only by education, training, continued practice and cultivation of a sense of humility and dedication to duty. These curbs can neither be bought in the market nor Injected into human system by the written or unwritten laws. If these things are there even if any of the protective measures provided by the Constitution and the laws go the independence of the judiciary will not suffer. But with all these measures being there still a Judge may not be independent. It is the inner strength of Judges alone that can save the judiciary. The life of a Judge does not really call for great acts of self-sacrifice; but it does insist upon small acts of self-denial almost every day”. The quote is equally applies to ‘collegium judges’ and ‘transferee judges’.